While much of the focus in Houston’s first-round series with the Utah Jazz will be on Harden and Chris Paul, Gordon might be the X-factor that could key the Rockets to a win in this series. Gordon enters his fourth postseason after averaging 16.2 points a game in the regular season. The 3-point specialist tied his career high three times this season by sinking eight in a game. He can be a streaky scorer, but when he’s on the Rockets are hard to beat. Houston has won 11 of their last 12 games where he’s scored 20 points or more. Coach Mike D’Antoni raved about the 30-year-old and had this to say when asked if the Rockets will win the series if Gordon has big games. “I don’t want to go too far out on a limb but, yes,” he said. It wasn’t just D’Antoni and Harden who stressed Gordon’s value to the team. Everybody chimed in to talk about what he means to the Rockets as they chase their first title since winning back-to-back championships in 1994-95. That, the Rockets say, is one of the things that makes Gordon so unique. He’s such a key component of the team, but he’s so quiet and unassuming, and does pretty much everything to stay out of the spotlight, that you’d never know it. The normally stone-faced Gordon did crack a smile when told of Paul’s description of his personality. But he says he comes from a family that isn’t “overly expressive” and even if he were to score 60 points he’d behave just the same. While the focus on Gordon’s game is his 3-point shooting, he also plays a big role for the Rockets on defense. The 6-foot-4, 215-pound Gordon is an aggressive and versatile defender who can match up with guards as well as big men. And while the Rockets might joke that he doesn’t have a pulse because he never gets excited or upset, they know that he doesn’t have to be overly emotional to be a factor in their playoff run. Jazz point guard Ricky Rubio, who averaged 12.7 points and 6.1 assists in the regular season, is expected to be ready for the series despite missing four of the last five games of the regular season with a quadriceps injury. 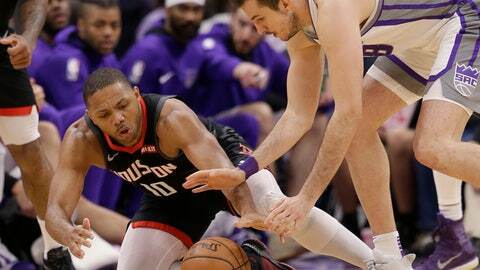 Rubio didn’t play against Houston in the playoffs last season after injuring his hamstring in a first-round series win over the Oklahoma City Thunder. The Rockets know his presence makes the Jazz much better and stressed the importance of keeping him from driving into the lane to make plays. The Rockets added three important pieces after the season began in Austin Rivers, Kenneth Faried and Iman Shumpert, which helped them stay on track when injuries to Paul and center Clint Capela left them thin. D’Antoni was asked how important the addition of these players was to the team. Capela returned to practice on Saturday after missing two days of workouts while recovering from an upper respiratory infection. He said he still wasn’t feeling great but hopes that he’s better by Sunday night.